The water itself is one of the most important parts of the pool, and must be kept as clean as you want. This is because dirty water will not only make the pool unsightly, it could also pose a health risk. It can be very easy for the swimmers to contract water borne diseases if you neglect the pool water. On the other hand, you also need to be mindful when it comes to keeping it clean. Do not overdo it with the chlorine, because using too much could also harm the swimmers. A good rule of thumb is that if the smell is too obvious and the water already irritates too much, you have to reduce the level. Do not believe the myth that a chlorine-smelling water is perfect. Chlorinated water is supposed to be odorless and colorless. Chlorine-smelling water is an indication that you used too much and caused a chemical imbalance in the water. If you neglect pool maintenance, algae can start to build up and will turn your pool green and full of brackish water. You can stay on top of algae growth by regularly cleaning the areas of the pool where algae buildup is more common, such as the bottom, the sides, and behind the pool stairs. It is very easy to lose track of algae buildup, and in severe cases you may really need to contact pool service in palm springs, in order to get professionals to do their job. One of the easiest ways to turn your water dirty and disgusting is to keep it stagnant. So if you want fresh, clean pool water, you need to install a water pump in order to keep the water circulating in the swimming pool. Regularly draining the pool and replacing the water is also an option, but this would not be cost-efficient as it would be wasteful on water. If you do install a water pump, you should also start to consider the fact that it will require maintenance. And possibly even repair, eventually. In this case, having the number of a pool service company handy is advised. It may not technically be part of the pool itself, but the gutters that line the outer side of the pool needs to be periodically cleaned if you want to keep your pool water clean. The reason is that water that is splashed out of the pool end up in the gutter, so any element or dirt from the water will eventually make its way back to the gutter and possibly back to the pool. The schedule of chlorine application is also important if you want clean pool water. You need to wait until the sun goes down, for a couple of reasons – this ensures that you and your family can enjoy the pool during the day. Second, adding chemicals at night when the sun has gone down ensures that the chemicals will not easily evaporate. Finally, you need to remember that you don’t always need to do pool maintenance on your own. 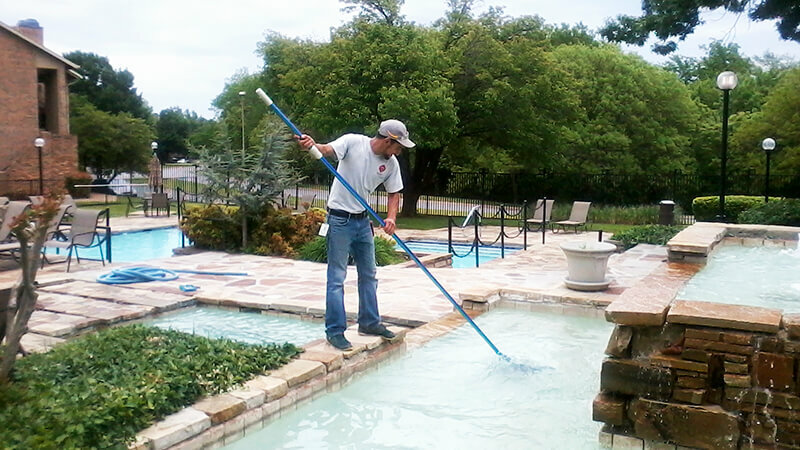 Sometimes, you need the expertise, skill, and manpower provided by a professional pool cleaning company. So don’t hesitate to call one from time to time and get your pool professionally serviced.